Status: Common regular spring migrant central and west, uncommon east. Uncommon, locally common, regular breeder north-central and west. Uncommon regular fall migrant central and west, rare east. Documentation: Specimen: UNSM ZM6611, 7 Jul 1902 Carns, Keya Paha Co.
Taxonomy: There are two subspecies, inornata of central Canada south to Colorado and Nebraska, and semipalmata of southeast Canada south on the Atlantic Coast to the Gulf Coast and West Indies (Gill and Donsker 2017). Nebraska birds are inornata; there are no records of semipalmata. Late dates above are away from the breeding range. Spring migrants occur throughout the state, although it is uncommon in the east. Arrival is in early and mid-Apr, with a well-defined migration peak in the last week of Apr. In 2013 surprising numbers appeared in the east, some at relatively late dates. These easterly sightings included 24 in Washington Co 8 May, three at Lake Wanahoo, Saunders Co 15 May, and 12 at Lakes Babcock and North, Platte Co 28 May. High counts: 153 in the eastern Rainwater Basin 2-4 May 1997, 140 there 22 Apr 2000, and 127 there 24-25 Apr 1999. Summer: Willets breed primarily in the western Sandhills region. Rosche (1982) apparently did not find Willets breeding in the high plains of the western Panhandle, remarking that breeding was “primarily confined to the sandhills region.” There is evidence that Willets breed sparingly further east, to the eastern edge of the Sandhills, notably in Holt Co. The several Holt Co records include an early breeding record(Ducey 1988), summer observations cited by Blake and Ducey (1991), a territorial bird 10 Jun 2011, and an adult and a young bird in Holt Co 10 Jul 2016. A copulating pair was at Pony Lake, Rock Co in early Jun (Ducey and Schoenenberger 1991), Two were in suitable breeding habitat in extreme western Knox Co 25 May 1998. There are three mid-Jun reports for the eastern Rainwater Basin, 3-26 Jun 1937 Adams Co (Jorgensen 2012, Swenk 1937), 15 Jun 2001 Harvard WPA, Phelps Co (Jorgensen 2004), and 18 Jun 2016, and a “territorial” bird was near St Paul, Howard Co 9 Jul 2007, possibly a migrant. High counts: 60 in Sheridan Co 14 Jun 2004, and 40 near Ashby, Grant Co 18 Jun 2006. Early dates above are away from the breeding range. There is an earlier date 19-20 Jun 2004 at Lake McConaughy, Keith Co, and later reports 2 Oct 2018 Douglas Co, 7 Oct 2006 Lake McConaughy, two on 8 Oct 2017 at Tamora WPA, Seward Co, 10 Oct 1985 Lancaster Co, 20 Oct 1991 Lancaster Co, 22 Oct 1992 Scotts Bluff Co, 24 Oct 2015 Conestoga Lake, Lancaster Co, and 25 Oct-8 Nov 1959 Platte Co. There are dramatically fewer fall reports than in spring, and Willets are rare in the east in fall. Willets likely vacate Nebraska soon after breeding; most leave before Sep, as there are only about 22 reports after Aug. In the eastern Rainwater Basin, Jorgensen (2012) identified two occurrence peaks, 9-21 Jul, presumably adults, and 11-17 Aug, likely juveniles. An early juvenile was in the eastern Rainwater Basin 25 Jul 2010. High counts: 20-30 near Bayard, Morrill Co on 8 Jul 2000, 29 in Lancaster Co 13 Aug 2006, and 23 at Lake McConaughy 29 Jun 2001. 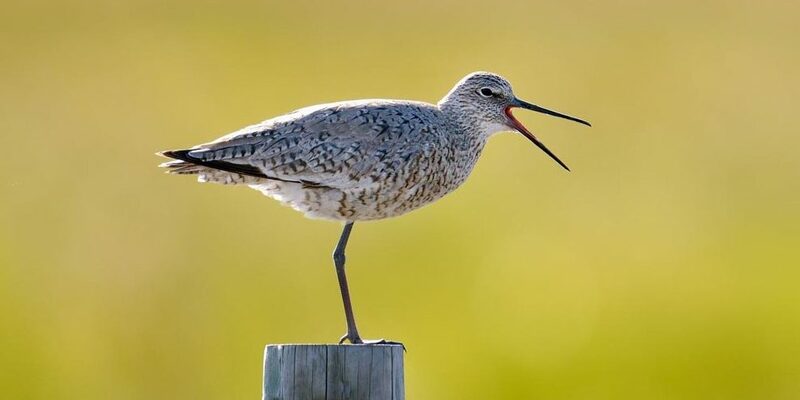 Photograph (top) of a Willet at Crescent Lake National Wildlife Refuge, Garden Co (date unknown) by Chris Masada and provided as a courtesy by NEBRASKALAND/Nebraska Game and Parks Commission. Ducey, J.E., and J. Schoenenberger. 1991. Some birds of the Pony Lake area of the eastern Sandhills, Nebraska. NBR 59: 55-58. Swenk, M.H. 1937. N.O.U. Cooperative Bird Migration List for Spring of 1937. NBR 5: 59-66.